I wanted the pages to be “pretty,” so I purchased a Franklin Covey weekly inserts package that came in a variety of pastels with cute quotes on some of the pages. The planning pages were fairly simple and clean/not cluttered. Monday – Thursday were on the left and Friday through Sunday were on the right, with a “notes” box under Sunday that was equal in size to the daily spaces. Each day was split in half. On the left, there was a box for appointments, and then a double (vertical) line separated that box from a smaller box for “To Dos,” but the box was violated with the holes that held the pages into the binder. So, I pretty much wrote at an angle on those pages to squeeze it all in. I also tried to track my time for which projects I worked on throughout the day, so that I could fill out my timesheet correctly. 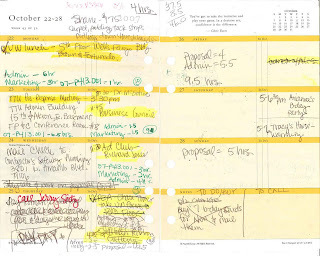 Overall, the pages were full, and each day turned into a chaotic mess of appointments, completely ignoring the To Do list box to fill in all the scheduled meetings. Also, random information was everywhere and in sporadic places. Click on the above photo for a great view of the hot mess of my weekly pages! The damn thing was a BRICK. With all that information in all those tabs, it must have weighed a good 3 lbs. Ladies, can you feel me that every pound counts in your purse? It was so fat and wide that I could barely hold it in my hand without getting a cramp! I liked that it stayed open and laid flat on my desk, but the heaviness made it awkward to transport. Also, I am very much an “out of sight, out of mind” person. So, all that information behind my tabs? Yeah, I completely forgot about them. As my sister might have told you, I once carried a Quo Vadis daily Textagenda during my Freshman year of college. I loved having all the space to record random thoughts, notes, and details for assignments. But, again, out of sight out of mind. Come Tuesday, I would open up the page, only to find that I had a quiz that morning! I had that tingly hot feeling throughout my body… like when you’re almost in a car accident… when I realized that I had completely forgotten to study. I forgot, because I didn’t flip through each day to see what I had going on. I didn’t have a week at a glance format that would’ve reminded me about what was coming up. What’s a girl to do? That’s when I went to my Filofax. But, obviously, once I started my career and my life planning involved more than homework assignments, such as meetings, bills, and planning a wedding or buying a house, I needed more. A year or so ago, my brilliant sister turned me on to the Moleskine week + notes style. OH…. MY…. GAH! (that’s a Will & Grace reference for all you fans out there). I heard angels singing! This style worked PERFECTLY for me. I had the week at a glance! I had the empty pages of notes to records all my random thoughts; to-do’s; directions to events; contact information for meetings; appointments; and lists galore. My (amazingly brilliant and totally awesome) sister suggested a Quo Vadis Trinote. I just got one in the mail the other day (courtesy of Karen at Exaclair in New York in exchange for a review), and finally I broke down and began to fill it with information from my Moleskine. So, far, I think I love it, but that complete review will come later. I’m scared to abandon my Mole, because it’s a great size with a hard cover, strap, and ribbon to mark the week I’m on. The flap in the back is AWESOME, and I love, love, love the removable address book, because I’ve made it a reference book instead of an address book. Under “C” I have all the information about my car… when I got my oil changed, when I got my tires rotated, the insurance company’s contact info, my loan number, etc. Under “A” I have the addresses and dates for every Address I’ve ever lived at and when I lived there. Under “M” I have “Medical Directory,” which lists the phone number for the pharmacy, the doctor, and contact info for my health insurance, eye insurance, dentist, and dermatologist. How awesome is it to flip to ONE page and have all that right there? Luckily, the Trinote has this feature as well. So, I’m not giving up that feature at all. In summary – the Filo was a brick with very little space to record all of my appointments, let alone my lists. The binder style format was great for holding information, but there was so much in there that I forgot to look for it, and it wasn’t as organized as the Moleskine address book turned reference book concept. I love my Moleskine, but I’m going out on a limb with the Trinote to see if there are benefits that I’ve yet to discover. That review is in the works as I continue to use it and evaluate its effectiveness. Sandy were you able to fit Franklin Covey sheets into your Filofax? I love my new purple Filofax but I am not loving the Filofax planners and sheets at the moment. I WAS able to fit Franklin Covey inserts into my Filofax! It's kind of faded in the picture, but the FC sheets were 6 hole punched and aligned with the binder rings of my Filofax.